The Dow stocks index last closed at a new all time high of 15,762. Many in the press and blogosfear immediately explained away the rise on the U.S. Non farm payrolls data, apparently blind to the fact that the stock market has been in a powerful upswing since the Mid October correction low, since which probability strongly favours stocks rising on any given day, and especially more so after a down closing day as was the case for last Thursday, and THAT Is why stocks rose Friday! MOMENTUMN and Upswing Probability. My expectations as of Mid October have been for the Dow to gravitate towards breaking above 16,000 before the end of this year, the unfolding trend trajectory has not only reinforced this expectation but implies that it could reach its goal far sooner, which could be even before the end of November. As I pointed out at the time that the stock market was entering its seasonally weakest period of the year and thus it was no surprise that the stock market would be falling going into October. Similarly, as we pass out of the Mid October seasonally weakest point of the year then the stock market can be expected to have an increasing probability for trending higher into the end of the year, which strongly suggests that the Dow too will be following its brethren into another new all time high BEFORE the end of this year. The technical chart picture resolves towards suggesting a multiple wave rally that forms a trend that resolves to the Dow trading to above 16,000. Which followed on from earlier commentary that warned not to be seduced or frightened by the perma-bear commentary at the height of the U.S. government shutdown and debt default crisis panic (remember that?) when the bears were once more found to be proclaiming a bear market or even crash as being imminent. The stock market’s recent advance to almost record highs isn’t a sign of good things to come, says John Hussman, president of Hussman Investment Trust. “[T]he present is a terrible time to accept a significant amount of market risk,” he says in his weekly market commentary. ELLIOTT WAVES - There is no decernable simple pattern, therefore at this point in time EWT should be ignored. MACD - Is converging towards a cross which suggests a correction of sorts is imminent, nothing major just unwinding of an overbought state. TREND ANALYSIS - The stock market is clearly in a rising channel, and has just hit the top of the channel which suggests that the next stop would be the bottom of the range. However the final resolution of this pattern for a bull market is to break out of the range to the upside. So what's neded to determine is the most probable time for such a breakout which would time well with a santa rally. SEASONAL ANALYSIS - December is less than 3 weeks away, the optimum time for santa's to deliver their traditional seasonal rallies. The overall seasonal pattern for the Dow is after a weak Sept to October to soar for the next 3-5 months. This year we have had the weak September to October and the stock market is soaring into November. The unfolding seasonal pattern suggests that the stock market could extend its rally all the way into March 2014. PRICE TARGETS - The immediate target is the upper end of the range on break of which trend trajectory would target at least Dow 17,000, with an extended forecast in my Stocks Stealth Bull Market Ebook implying an eventual Dow bull swing target of 18,000 (FREE DOWNLOAD). On the downside strong channel support comes in along the past highs implying 15,550, 15650 and 15,700 to contain corrections and then further out at Dow 15,000. The significant factor in determining a trend forecast conclusion is to consider when the stock market will breakout of its rising channel, for the direction of the breakout is set as being UPWARDS because that is the direction that bull markets resolve in. But when ? In terms of probability that would be during a December rally which fits in with the above analysis suggesting a minor correction during the next couple of weeks, to prep the market for a December rally that BREAKS above the channel that would then act as support for the Dow. I expect the Stock market to break above the upper channel of Dow 15,770 and be trading above 16,000 by late December. Furthermore my analysis suggests that despite a volatile January that will likely bring forward many bankrupt doom merchants, the stock market will likely continue its rally into March 2014, when it is highly probable that the Dow will be trading above 17,000! Dow 17,000 by March 2014 means that many more bears will be crucified! But seriously, whatever actually transpires, understand this that probability favours RISING stock prices into March 2014. Twitter Bubble Price Crash? An Ad Per Tweet Solution? Twitter that has yet to make a single dime of profit was floated last Thursday on the NYSE at $26 per share and immediately saw its stock price soar to close up 73% on the day at $44.90, valuing the company at more than $24 billion. The obvious comparison for what could happen next to the Twitter's stock price is the Facebook example, which peaked on its IPO day as many rushed to bet heavily on one of the social networking backbones of the internet, dreaming of monetizing on its then 900 million users. Facebook in my opinion is a re-run of the lastminute dot com bubble IPO, that saw the value of initial investments all but wiped out. Facebook is probably being priced at X6 its value therefore investors have the potential to sufferer as much as a 85% loss on the IPO before the stock hits bottom. The expected slump in the Facebook stock price could start as early as today when the stock starts trading. Bottom line - If you want to invest in Facebook, then you will be able to pick up the stock at a fraction of its IPO price in the not too distant future. How has the Facebook stock price performed since its May 2012 IPO? The stock price crashed from it's first day close of $38 to just $18 less than 4 months later, a 53% price crash, however this year Fed QE-4-Ever and an monetization blitz has helped to inflate the Facebook stock price to stand at $47.50. 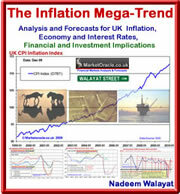 The consequences of which has been that the number of 'REAL WESTERN' users has continued to diminish since the IPO as most of the new users are either situated in the developing world, on incomes of less than 1/10th of that in the West, or outright frauds, Likes and Post farms hired to inflate stats, again situated in developing nations such as Bangladesh. Implications for Twitter are even worse than for Facebook investors because Twitter is even more over valued than that which Facebook was at IPO for Twitter reported a loss of $132mln compared to Facebook's $1 billion at its IPO, but don't worry because Twitter promises that its earnings will some how magically jump from -$134 mln to +$1billion next year, though the only way I can see them coming close to achieving this is if they put up an ad per tweet. In my opinion, in a best case scenario Twitter will be lucky to make $400 million in profit next year which would value the company at 60X earnings, which translates into a potential 50% STOCK PRICE CRASH! And that's my best case scenario. So just like Facebook before, I expect the Twitter stock price to crash to trade at LESS than 50% of its last closing price ($44.90), the only thing that would prevent such an eventuality is if Twitter ramped up advertising to the rate of an Ad per Tweet! What about the long-term prospects for Twitter and Facebook ? Today Twitter says it has 230 million users of which perhaps 100 million of whom are real active users, which means whilst in the future the official number of users will continue to grow, for anyone can create 100's of accounts for themselves, however the number of active individual western users is likely to shrink, the rate of attrition will only become apparent in future years as Twitter will not be able to capitalise upon fake and poor users, because whist the mainstream press is dumb enough to believe the official states, the advertisers usually aren't so dumb as they will see that their ad spending fails to convert into sales because the users that they thought were there are just not there! So given what happened to past social media giants such as Bebo and Myspace, it is highly probably one, if not BOTH Facebook and Twitter will be trading as mere shells of their former selves with less than 1/100th of the real active users as opposed to the bots, and third world Facebook Likes and Tweet farms. 1. Those areas that fell the hardest during the crash are seeing the greatest bounce in prices. 2. Affluent area's tend to fall the least and recover strongly. 3. Most of the properties in the middle of the range tend to exhibit weak growth and many areas continue to stagnate. All of these effects take place in virtually every city situated outside of the South East that is in full boom mode. 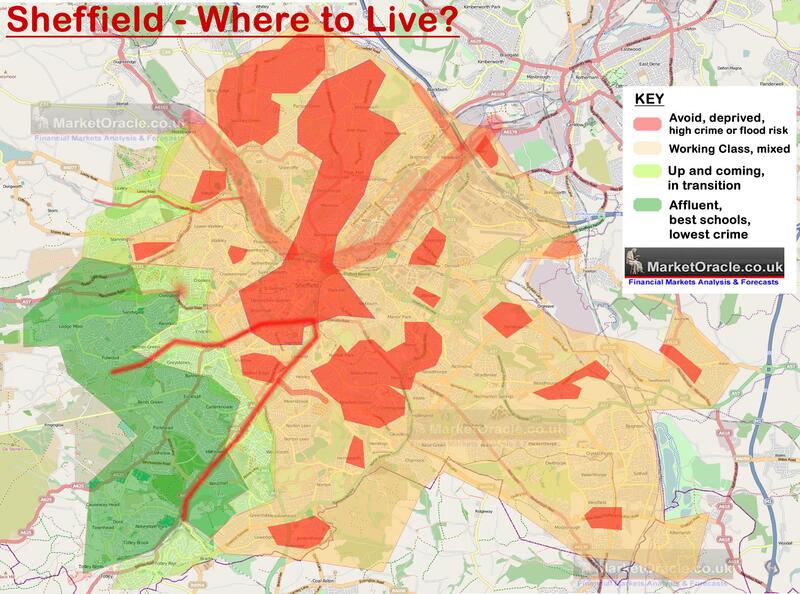 My recent in depth analysis of the city of Sheffield illustrates the disparity in trends even within cities of that between differing areas of the city as the strongest trends in house prices will tend to take place in the affluent and the deprived areas (deprived fell harder and a smaller £'s rise results in a higher percentage rise) over that which many will experience in the large volume of midlding ends of the property markets. In summary, prospective home buyers should take notice of the fragmented nature of the city which can make a huge differences both in terms of the quality of life, school catchment etc. However, the best areas of the city can be found to be concentrated in the South West of the city as the affluent residents continue to price most local house hunters out of these areas, just as is the case for many areas of the UK. Furthermore, the most affluent area's of the city tend to have a buffer zone of up and coming areas that acts to further the gap in house prices between relatively short distances. What this means is that whilst the pseudo-economists (journalists) that populate the mainstream media focus on average house price trends, instead the reality is of a highly fragmented and buffered market that results in areas of Sheffield that rival anything that can be seen in the South East of England in terms of house prices, which I am sure will come as a shock to many house hunters who tend to look at the academic statistics, the averages that will FAIL to give a true picture of Sheffield's housing market for instance a 4 bedroom detached house in S11 typically starts at £400k, whereas 2 or 3 miles distance a similar sized 4 bed would typically cost less than £200k. The near silent war that the mainstream media rarely reports rages on in Pakistan as illustrated by the recent drone attack that killed the Taliban leader in North West Pakistan the day before the Pakistani government was to enter into peace talks with. Whilst many may claim so what it's just one terrorist killing another. However what the drone strikes mask is what is called collateral damage, which according to the Centre for Naval Analysis has to date killed close to 5,000 people of which 9 out of 10 were civilians. The drone war on Pakistan is clearly underway in collusion between the US military, CIA and those that hold the real power in Pakistan, the Pakistani Military and Intelligence Agencies, for there is no way such a war could be conducted without consequences if it were not for the fact that most of the Pakistani high ranking officers have been on the payroll of the CIA for decades. Pakistan is a smoke and mirrors democracy that is ruled by a military dictatorship, an extreme example of what is the case for all nations including the US and UK with their war hungry military industrial complexes demanding periodically that enemies be conjured into existence. The consequences of the ongoing U.S. Drone war on Pakistan is for most sections of Pakistani society to drift towards a more religiously aligned society as opposed to the preceding trend which had been towards that of a more secular society. In geopolitical terms this means a more robust adherence to the Sunni faith, stoking up of the age old conflict between Sunni (1.2bn) and Shia Islam (200 mln), mostly centred on neighbouring Iran, which whilst in the strategic interests of the U.S. i.e. an Iranian / Pakistani animosity as illustrated by recent border skirmishes between para-militaries, however it has far wider implications in terms of the unintended consequences of pushing Pakistan further down the path of an Sunni Islamic state along the lines of Saudi Arabia in an attempt to further encircle the Iranian Shia Islamic state. The unintended consequences is that a Sunni NUCLEAR Pakistan is seeking to reinforce alliances with fellow Sunni states, which means the predominantly wealthy Gulf states headed by Saudi Arabia that it sees as potential sources for revenues and financial aid both against contrary U.S. and Iranian interests. What Pakistan has to offer for sale is it's nuclear weapons technology, and unlike Iran, states such as Saudi Arabia do not have to embark on multi-decade long nuclear programs that would draw sanctions from the West and sabotage from the intelligence agencies and even military strikes from Israel, but be purchased off the shelf direct from Pakistan that stands ready and willing both for financial benefit and in its geopolitical and religious interests of aiding the Sunni cause both against Shia Iran and Israel. The BBC recently reported that Saudi Arabia has several Pakistani nuclear weapons on order, ready to be dispatched and near instantly deployed in already built missile silo's to act as deterrence against either Iran or Israel. Saudi Arabia has invested in Pakistani nuclear weapons projects, and believes it could obtain atomic bombs at will, a variety of sources have told BBC Newsnight. While the kingdom's quest has often been set in the context of countering Iran's atomic programme, it is now possible that the Saudis might be able to deploy such devices more quickly than the Islamic republic. Earlier this year, a senior Nato decision maker told me that he had seen intelligence reporting that nuclear weapons made in Pakistan on behalf of Saudi Arabia are now sitting ready for delivery. Last month Amos Yadlin, a former head of Israeli military intelligence, told a conference in Sweden that if Iran got the bomb, "the Saudis will not wait one month. They already paid for the bomb, they will go to Pakistan and bring what they need to bring." Since 2009, when King Abdullah of Saudi Arabia warned visiting US special envoy to the Middle East Dennis Ross that if Iran crossed the threshold, "we will get nuclear weapons", the kingdom has sent the Americans numerous signals of its intentions. "I do think that the Saudis believe that they have some understanding with Pakistan that, in extremis, they would have claim to acquire nuclear weapons from Pakistan." The problem with all religious ideologies be it Christianity, Judaism or Islam is that they have an inbuilt desire for armageddon, end of the world, judgment day, for instance the Jewish and Christian bibles expect 2/3rds of humanity to perish in the pursuit of prophecy so that the Messiah / Jesus / Isah will return in a place located in Palestine / Israel (Megiddo). Meanwhile for muslims the day of judgement won't arrive until the muslims fight and defeat the Jews (Israel) where the location of the final battle will be in Syria (Bilâd al-Shâm), so all faiths and their derivatives expect a form of apocalypse that will lead only their faith to victory and entrance for the believers into paradise for eternity. This is why we see the thirst for the apocalypse playing out in Syria today for this is the place for the final conflict in terms of signs of the apocalypse and thus many muslim fighters on BOTH sides are eager fight to the death as they perceive their actions being towards the fulfillment of prophecy and for rewards in the afterlife.. However, the big problem today when compared against past conflicts and thirsts for armageddon is that many countries now have the potential means to make the apocalypse made manifest. Leading the pack of armageddonists in the region is Israel with approx 250 nuclear weapons, then Pakistan with 120 which is willing to sell a number to fellow Sunni states such as Saudi Arabia and probably secretly already has given that Saudi Arabia has at least 2 large missile launch sites ready and awaiting their arrival including a number of CSS-2 missiles in place to carry them. All of which increases the risks of an Islamic Sunni / Shia conflict triggered nuclear apocalypse which by the nature of the region would soon include Israel that has within its means to annihilate the entire region, which could trigger an even larger scale use of nuclear weapons i.e. Pakistan, India, China and beyond. The key to preventing triggering nuclear armageddon is to prevent Iran from attaining nuclear weapons, for as soon as Iran has nuclear weapons then so will instantly Saudi Arabia and not too long afterwards Turkey and Egypt are likely to follow. 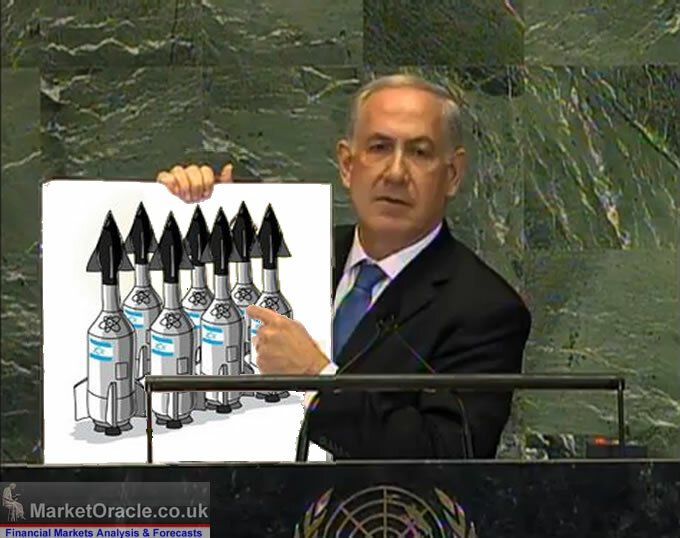 Israel's nuclear weapons are not a deterrence, instead they are an encouragement to fulfill prophecy. The bottom line is this that the region MUST become a Nuclear FREE Zone which means not only dismantling Iran's nuclear programme but also Israel's, for as long as Israel has nuclear weapons then so will other countries actively engage in developing their own nuclear arrangements as a deterrence, but it will only take ONE nuclear war to END the region FOREVER. Unfortunately neither the Israeli, Iranian or Saudi fundamentalists realise this truth so the region remains on a countdown towards certain armageddon which will result in all of the respective so called prophecies being vaporised for eternity. There won't be any second coming of Jesus, Messiah or Mahdi, just a wasteland more barren than the sahara desert. Yours I am Marcus Licinius Crassus analyst preparing for the santa rally that will likely roll on and on all the way into March 2014!